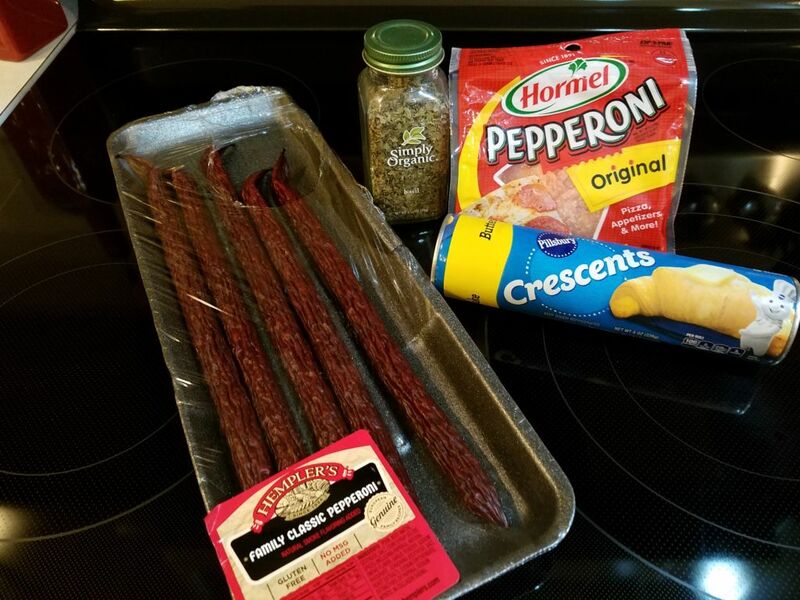 Frightfully fun rolls with surprise pepperoni in the brim that the whole family will love! 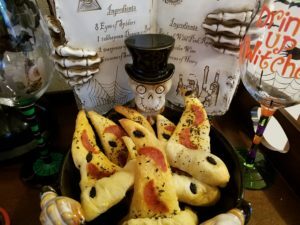 There are so many recipes out there with Halloween themed food, but as you have probably noticed, most of them are for sweet treats. 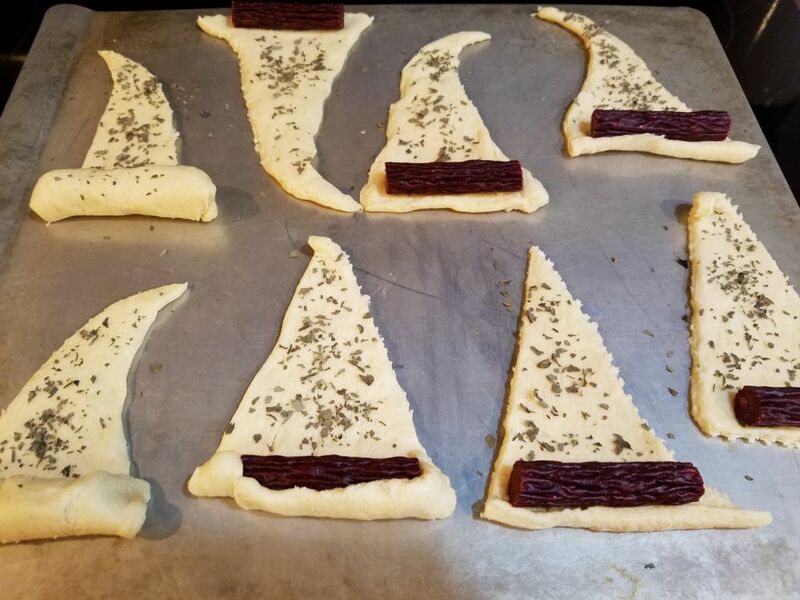 With the recent focus on trying to cut out excess or processed sugars from our diets, these Witches' Hats are a great quick snack. With everyday ingredients, you can quickly make them in advance and pop them in your kid's lunch box for a fun alternative snack for the season. One of the traditions that our family has is to enjoy a spooky, Halloween themed dinner before trick-or-treating. It took me several years to gather my favorite recipes that can make a balanced meal (that still includes a lot of treats!). As the season progresses I will share more ideas, but one of the most recent additions to our festive menu were these quick and easy Witches' Hats. To make these cute hats all you need is some crescent roll dough (I prefer the butter flaked variety), pepperoni or salami sticks, sliced pepperoni, and a bit of basil. These are so easy and a great opportunity for your kids to help out in the kitchen too. 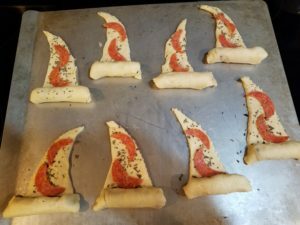 They will love being able to roll the pepperoni and decorate with moon shaped pepperoni slices! After the rolls are out of the oven, I also like to add some candy spiders for and extra spook!. These will be sure to be one of the favorites on the table. Gather your ingredients and let's get started! 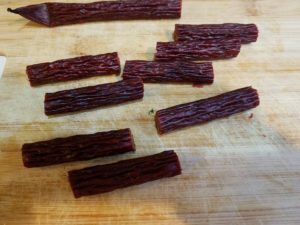 Cut pepperoni or salami stick into eight, 2" pieces. Cut pepperoni slices into crescent moon shapes. Tip: Use the edge of a small circular cookie cutter for easy, even cutting! Separate dough and place on a cookie sheet. Gently shape the dough into long triangles. Sprinkle evenly with basil. Place 1 pepperoni or salami piece along the base of the dough triangle. Partially roll up the dough to cover the pepperoni/salami to create a hat brim. Place 2 pepperoni crescents on the hat. Bake 8-12 minutes or until lightly golden. Meanwhile, warm up a sauce of your choice for dipping, and enjoy!